The Panasonic Leica DG Vario-Elmarit 50-200mm F2.8-4 is a powerful - and portable - telezoom for Micro Four Thirds cameras, providing the equivalent of a 100-400mm focal length range. On paper, this compact stabilized zoom is perfect for wildlife photography, in environments where large, heavy lenses and tripods aren't always practical. We recently returned from a trip to Yellowstone National Park with the 50-200mm and the Panasonic Lumix DC-G9. Check out our gallery to see how we got on. This gallery was shot on location, during a video shoot supported by Panasonic. Isn't the real competition for this lens the Oly 40-150 pro + 1.4x Tele? Will be interesting to see those direct comparisons. I have the Pana-Leica 100-400 and this lens does not only impress by being sharp wide open at the long end. Built quality is also exceptional and similar to my Zeiss 135 APO Sonnar. Captions on the lens barrel are not just printed and easily wear off as with many Nikon lenses, but the colour fills engravings which is meant to last. Panasonic has done a great job with lens design and Leica is not just marketing. In fact they had to do so given the very good reputation of lenses from the direct competitor Olympus. Can I assume that this new lens will run rings around the panasonic 100-300 F4-5.6 ? I currently have that lens and am somewhat underwhelmed by the sharpness and microcontrast on my OMD EM5 ii, not saying that it's bad, just not particularly impressed. Heh, I actually just bought the 100-300 II (for use on an E-M5 II as well! ), had been waiting on the specs of this one but the price is a little too high for the sporadic use I'll give it right now. 'Course varying conditions and sample variance can make it hard to draw conclusions from any one comparison, much less project them unto lenses not even in said comparison. I like the 100-300 ii. Are you sure the contrast is not just disappointing because you're imaging far away things? yes pretty sure. I'm well aware that the contrast in the distance can be reduced by atmospheric efefcts. But as said not over impressed with the 100-300. It's OK but not that impressive. My Nikon 70-200/F4 used on my D7100 is a different category of quality for example. I'm hoping the 50-200 Panasonic lens might also be in that category too. If so, I'll probably buy it! Your camera/lens combo may need calibration. Despite not having a mirror, if your camera is using phase detect, it may still benefit from calibration to adjust for manufacturing tolerance variations in the camera and lens. All manufactured items have variation. When two items like a camera and lens are combined, one hopes the variations cancel each other out but sometimes they are additives. My omd em5ii uses only contrast detect. So no calibration needed. An interesting Gallery .i wonder how the Leica-100-400 would habe fared. I am impressed by th e result achieved in These conditions. Excellent work with only 400mm available. I shoot m4/3 and love it but hate statements such as, "providing the equivalent of a 100-400mm focal length range". This equivalence thing is misleading marketing hype. 200mm has the same angle of view in any format. Except for variations in flange distances, the size of the image on the sensor and pixel density is much the same. However, because the sensor is smaller, when printed to a similar print format, it gives the illusion of being a larger image. So let's stop talking equivalence and just accept that m4/3 is a smaller format with its own pros and cons. "200mm has the same angle of view in any format." Or at least, is so obfuscated from the practical use of lenses and cameras as to be a meaningless statement. If you mount a 200mm lens on an 8x10" view camera, the field of view will be completely, unrecognizably different from the same 200mm mounted on a 1/2.3" Pentax Q. Sure, if you put the 8x10 camera and the Pentax Q the exact same distance from your subject with the same 200mm lens, you could crop the exact same (tiny postage stamp) of an image as the Pentax Q out of the center of the view camera's image. But literally no one uses a camera that way, and it's profoundly unhelpful to think of it that way. bobT3218. With the two cameras side by side, the image seen through a 200 mm lens, on a micro four thirds camera, will be axactly the same as a the image viewed through a 400 mm lens on a full frame camera. It doesn't get simpler than that! Forget the word equivalence and just try to understand what I just told you. I can vouch for that statement as well (same angle of view). I recently went shooting with a friend who was using a 150-600 lens on his D-850, and the image on my LCD screen with my 75-300 was exactly the same size at 600 mm as his, shooting from an identical location. Thank you! That's exactly my point. The size of an object's image relative to the image circle may be much the same with a 200mm m4/3 as on a 400mm FF but the pixel count of the object in FF is much higher. In PP, once cropped down to the desired object, their is simply no equivalence as marketers want one to believe. M4/3 lens manufacturers seem, very often, fancy of mixing the angle of view with reaching power of a lens. 200mm focal length is always 200mm. "A 200mm on micro four thirds makes an image circle half the diameter as a 200mm on full frame. The full frame lens sees 4x as much of area...."
Image circle size doesn't matter as long it fills the sensor. The sensor width and height rules the FOV with the FL when focal length is identical (same lens). A TWICE larger sensor has FOUR times the surface area. 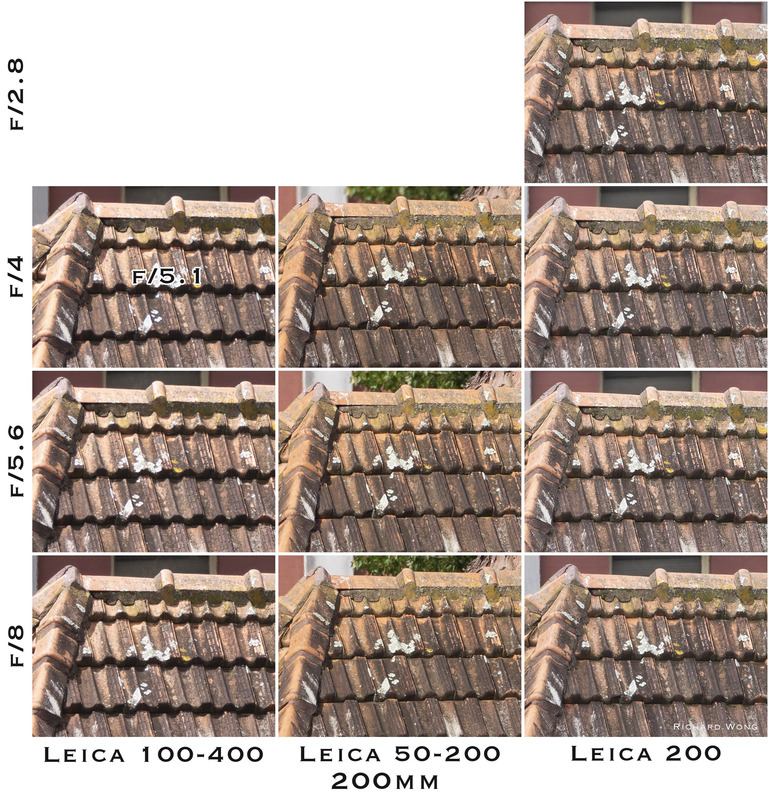 200mm sees TWICE larger FRAMING than 400mm does WITH SAME SENSOR. A 400mm requires twice more light than 200mm does with same aperture because 400mm magnifies two times more than 200mm and why 200mm does receive four times more light through same aperture than 400mm does. If you look a 1x1m size object from 5m distance and then you move to 10m distance, the object is twice smaller so you divide heigh and width by two because you move two times further. You do not divide by four. Of course image circle matters and of course it doesn't matter if the sensor doesn't fill the image circle. Why are there so many confused people on the internet? Do you redefine math to fit whatever narrative you have? But telling people the FoV is not particularly useful, because then you'd also need to list the image circle, as many FF lenses are sold that can also be used on APS-C, so you'd have to list two different FoVs. And then many people would just want to back-calculate the real focal length, in case they wanted to adapt it to a different system (like M4/3). It's all a lot more confusing than just learning how focal length and aperture works. What do you mean? They can crop the fov just as well as they can crop the focal length when they are adapting lenses... It's the same math, just more meaningful. Image circle is only a optical design to limit lens diameter to smaller. Focal length didn't change. A 200mm is 200mm regardless of the format. Just learn to accept it. Go back to basic and get a pinhole camera and to trough all via it. Or get a technical camera and same thing. With a pinhole camera you eliminate optics but you have a aperture. The difference you will have is inverted square law about exposure from center of film/paper/sensor to edge because you do not have a lens to "slow down" light to get it evenly on specified area that is called "image circle". The focal length and paper/film/sensor size controls what is field of view being captured, not the image circle. Image circle is only about to control camera size (= body + lens/aperture). There are two defining sides of a right triangle. The focal length and the image circle. A 200mm Lena on micro four thirds has a smaller image circle and projects less of the world. I have no idea how you think a 200mm is the same on any format. This is just a stupid thing to say. As it's just not true. Yes they all have a 200mm focal length, so what? That's evident from the numbers but not a useful fact. "A 200mm Lens on micro four thirds has a smaller image circle and projects less of the world." That's actually not necessarily true, either, and you have no way of saying that without testing it. Supertelephoto lenses often project image circles much larger than required to cover the sensor. It is not the limiting variable in the design process. Almost exclusively, the limiting variable is the entrance pupil diameter. Assuming they don't have baffling to prevent it, both the Panasonic 200mm/f2.8 and the Olympus 300mm/f4 undoubtedly cover APS-C, and might even cover an FF sensor. That's really irrelevant isn't it Androole? Whether or not it's true. I very much doubt the image circle of those lenses even cover APS-C without heavy vignetting, something "you can't say without testing". Regardless, it's a moot issue. What is the lens mount? If you're putting a lens on a lens mount it wasn't designed for, you should be doing the math of what field of view to expect. It should e perfectly acceptable for a camera lens maker to advertise the field of view given a specific lens mount instead of telling consumers the focal length. Again, more pedantic people confused by focal lengths and f-numbers. But this is probably all to the camera manufacturers benefit... So I doubt they will ever make these advertising stats more sensible for consumers. The teensy-tiny 45mm/f1.8 covers APS-C with barely any vignetting, and the even teensier 20mm/1.7 does as well once distortion correction is taken into account. Image circles get larger with longer focal lengths, and high-grade lenses tend to have even more oversized image circles in order to ensure excellent corner quality. The Sigma ART lenses and the Zeiss Otus lenses easily cover 44x33 medium format, for instance. Anyway, I fully stand behind my claim that the 200mm/f2.8 and 300/f4 would easily cover APS-C, irrelevant though it may be. I only bothered making that observation in the first place because of your bold assertions about image circle, specifically with regard to 200mm lenses, and the very notion that doubting it was "stupid." Many people have noted that most of the samples are shot at high ISO, stopped down, and therefore don't highlight the lens's strengths. Barney Britton says that this was deliberate - for example, to test IS. He also did not post-process, in order to provide unadulterated samples. For those interested in seeing what this lens can do, I've post-processed one of Barney's few 200mm photos that were shot wide-open at low ISO. Sharpness and detail are impressive. A good point. However, I don't know what other users would use this for but I have an Oly 50-200mm SWD which I use for wildlife almost exclusively at 200mm and high ISO. Despite IS, camera shake is a killer. Noise can be ameliorated in post but not blur. I rarely use it at 50mm except when I'm caught without a shorter lens. Having said that, I would dearly love to replace my beloved 50-200mm with the Oly 300mm f4 PRO if I could afford it. No one is forcing you to shoot M4/3 with this lens. By all means, lug around your bulky full frames with your giant telephoto's. Might I remind you that not only is this a Panasonic Lens, it is also a LEICA lens. Balk at the price all you want. Compressed jpegs on DPreview probably do not do this lens justice. Sure you're not going to get the kind of separation you'd expect from from a faster lens. Hater or not hater this lens is rediculous priced. It was my intention to buy it but it’s more expensive than a Canon FF 100-400 mk2 lens vere I live. It's no more a Leica lens than is a Sony made Carl Zeiss a Carl Zeiss. It's badge engineering with the lenses supposed to pass some sort of Quality Assurance that allows them to carry the name. Optically they popped out of the same sort lens design software all manufacturers use. @yxa That is incorrect, the Canon is $200 more. @Yxa - regional market pricing is confusing. Where you live, you say the Panasonic is more expensive than a Canon 100-400. In North America, the Canon 100-400 is 30% more expensive than the Panasonic. Who's the blame there, who knows? Consumer market arbitrage rarely makes a lot of sense. In Sweden the 50-200 is more expensive than the Canon 100-400 Mk 2 lens. I would compare 50- 200 with a 70- 200 and in that light its over priced. Canon / Nikon / Sony 70-200/f4 with IS costs $1100-1500. Their 70-200/f2.8s with IS costs $2100-2800. This lens is f2.8-4, so the middle of those price ranges is $1600-2150. This lens costs $1700. So it's definitely not overpriced by the standards of any of its competitors. It only looks overpriced compared to Tamron and Sigma, but literally every manufacturer looks badly overpriced compared to the 3rd party manufacturers that can make up for lower margins with higher volumes. Or a F5.6 to F 8 equivalent. Now you're trying to play it both ways. Your statement doesn't make any sense. It's either a 50-200/f2.8-4, or a 100-400/f5.6-8 equivalent. The one thing it is absolutely not, and never will be, is a 50-200/f5.6-8. At $1,700 this lens does not impress me. I would expect an f1.8-2.8 OIS lens with that focal length range of 50-200mm for that kind of money. A full f2.8 lens made particularly for m4/3 could be quite small, as could a 70-200mm f2.8 OS lens for APS-C (too bad nobody makes one . . . still). It's hard to understand how there isn't already a great 100-300mm f2.8 lens for m4/3 that outperforms this lens for under $2,000. Sigma's huge 120-300mm f2.8 OS Sport lens definitely outperforms this lens, but it's a bit more money and it's huge, because it covers full-frame sensors. Panasonic had the opportunity here to make a truly stellar lens, but this isn't looking like they've done that. I guess it's better than the 45-175 though, so there's that. Unfortunately it's more than three times the weight of that lens. Shame on Panasonic. Still . . . I guess it's well under 1 kilo, and that's saying a lot for a lens that's equivalent to a 100-400mm L on a Canon full-frame camera, like the 1Dx Mk II. The Canon lens is more expensive and about three times the weight. You probably shouldn't buy it. Also your expectations are ridiculous. @Scottelly. And 1 Stop better. I have been expecting much more from a 3000$ lens. I dont think the price justify the results posted here (it might be to the slow shutter speed like 1/250....who shoot wildlife at those speed???). My Sigma 150-600 provide better results at 400mm honestly in regards to the sharpness which is 1/3 price not to mention the extra reach if I need. The only nice thing is the weight which is around 60 percent of 100-400 full frame lens and I would apreciate it at times. sorry my fault about the price but I am standing behind the rest still. Yes, but the price of the Sigma Sport lens is more, and as you said, it is heavier. The Sigma 100-400mm is 1160 grams, but it doesn't have weather seals. The Canon 100-400mm is 1640 grams, and this Panasonic 50-200mm is just 655 grams, but about the same price as the Canon and more than twice the price of the Sigma 100-400 C lens. Unfortunately, Sigma does not make a long zoom lens for m4/3 cameras. If they did, I bet it would be better than this Panasonic, and it would be about half the price. It seems to me that there is a lot of opportunity out there for lens manufacturers in the m4/3 market. At 370 grams, the Panasonic 45-200mm f4-5.6 II OIS lens sure seems like the better lens for portability, price, etc. 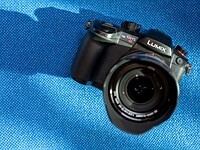 It will be interesting to see some comparisons between this new lens and that older, and much cheaper, Panasonic lens. I'm actually surprised Olympus doesn't make a 50-200mm f2.8 or something similar to this new Panasonic lens. I guess they figure their 40-150mm f2.8 is enough. Its not, the Sigma 100-400 is C and is 699, Sigma 150-600 C is 799-899 usually. @Lambert4 Hi thanks for asking. It's been a few years since switching from Nikon (AFS) to OMD. I get v fast AF with my pro zooms easily a match for anything the D700 could achieve. The 40-150 with converter is still but occasionally will focus on background if subject is low contrast. My 80-200 ED was second gem so slow in comparison naturally. Best AF was with 28-70/2.8. Wow - $3000 worth of equipment. I have a 55-300 on a d5500 that looks very competitive with this for less than $700. Here's DPReview's testing of the D500 with the new 70-300 DX AF-P VR. $2300 kit. Not weather-sealed. Unfortunately those photos don't show what that lens is capable of at the long end. There isn't a single shot of a distant building wall or anything like that. That's sort of my point. The 70-300mm images are using Nikon's top-end $1900 crop body, filling the frame with their subjects (cooperative humans, tame animals, and still life), at close distances so there is no haze or atmosphere between the lens and the subject. And yet when you compare them directly, you certainly can't say that the images are sharper or have more detail than the best examples in the Panasonic gallery above. If anything, it makes you appreciate just how little chromatic aberration the Panasonic-Leica lens has compared to the significant fringing that appears in many of the Nikon samples. Obviously, you'd expect that a $1700 lens would be better than a $400 consumer lens, even when mounted on a $1900 body. So it should be a surprise to no one that the PL50-200 is, in fact, noticeably better. But - that is the point - compare the two galleries. The pany is not better and especially not significantly better than the give away DX kit lens from Nikon. Now - you say it is on Nikon's top DX body - sure, it is. But in an IQ test - it would have performed the same or better on a D5500. I just can't see the "better" in this pany lens. Maybe it was just the terrible selection of images that don't show its ability - not sure. But in the few images that are sharp - it doesn't look significantly better to me. So, it should be fairly light and compact. As FF shooters complain about these types of lenses being suitable for daylight only, not heavily overcast or dusk/dawn. Pricey, but seems a great lens for m4/3. Most of my lenses are sigma or tamron for pricing reasons. I hope m4/3 get some good third party lenses.... For that price my wife and I could enjoy a week in Vietnam. My go to lens for wildlife is f/5.6 (800mm). That's more than adequate in most circumstances, including dawn and dusk. @Paul What are you shooting at dusk/dawn? Must be fairly motionless. To freeze motion usually that bumps up the shutter speed and drives the ISO into ugly territory. I assume you are not using that lens for Instagram lol. Yes, the equivalent FF aperture would be f5.6-f8 since it is a 2x crop factor. I won't have the chance to visit Yellowstone under snowfall, but so far all the samples that I've seen for this lens are quite unsatisfactory. The ones over at IR are meh, eCrapzine didn't post a single one at 200mm, and these are iffy. I have much better bird photos from my RX10M3 (not at hand, unfortunately, as I'm away from home). It's not an extraordinary claim, BTW. Anyone who has used an RX10M3/4 knows that the zoom on those things is stupid sharp even at 220mm and f/4. Add the overperforming 1" sensor to the mix, and the MFT solution looks very weak in comparison. Sure, the Oly 300mm is great, but it costs an arm and leg. Kharan is of course wrong. I have experience with the RX10/4 and the zooming is painfully slow. At 400mm it is basically F4 on a 1 inch sensor which means it has a 1 stop disadvantage. And while the lens is good for a super zoom, it can't compete with a sharp telephoto zoom. Then there is the problem that the lens is fixed, so there is no option for wider aperture primes. Honestly if all one wants is 400mm and a 1 inch sensor, but an old Fz1000 for 1/4th the price of the RX10/4. If you want a weathersealed ILC for wildlife and hiking get this lens or the 100-400 with a G9. From the reviews I have seen it is not far off the 200 mm F2.8 Leica. It is an exceptional lens. Claims need evidence. It is highly unlikely a lens on a superzoom can do anything like this, but I did not make the claim so may be you can point us to some articles with a comparison to support your views. Mastering Light: If you want to attack others, I'd recommend you to get your facts straight first. The RX10M4 is 600mm equivalent, not 400mm; just the additional magnification will counter the smaller sensor size. Seriously, as both a MFT and 1" camera user, the two formats are extremely close in performance, more so than APS-C and 35mm, for example. Even if the lens is slow to zoom, it's as sharp as it gets. It can easily outresolve the 20 MP sensor (just look at samples of bird photos with moiré, there's plenty) at f/4, while I haven't seen a single sample of the new 50-200mm that is pixel-sharp. I don't really understand this conceptual blackhole that's associated with M4/3. A lot people seem happy to suggest that 1" sensor cameras - with sensors half the size of M4/3 - can easily produce superior images. But the idea that M4/3 could ever produce superior images to APS-C is laughed at. This, despite there being a smaller difference in sensor size between M4/3 and APS-C (2/3 stops) than between M4/3 and 1" (1 stop). Do you really believe that there is this huge technological capability gap that only happens to exist in the M4/3 world? Even though the sensors are being produced by the same company (Sony), and the lenses are being developed by companies (like Olympus) that have world class reputations for optical design. Androole: No, there's a reason I own MFT cameras (I'm currently testing a Panasonic G85). 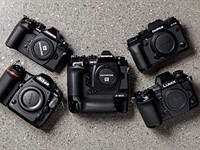 They're perfectly capable of good results, their low-light SNR isn't far off APS-C's, the standard and wide lenses tend to be better than the usual crop fare, and the cameras are fully featured. But for some obscure reason, the supertele end of things has been pretty badly treated by the MFT consortium. We either get stupid expensive, heavy lenses, or consumer offerings that are overpriced and mediocre. And this is an area where the format should shine! I find it baffling that so many people will defend a lens which, if evaluated by the samples posted here, should be nothing more than a $500 affair. When a 1" superzoom or an APS-C DSLR with a bog-standard 70-300mm lens do better, there's cause to worry. You continue to spread misinformation and lie about others posted. I never said the RX100/4 only went to 400mm. You know that I picked that focal length because it is the topic of this article. It is also very true that the RX100/4 zoom is painfully slow. If the lens is at 30mm it takes a while to get to 400mm. If time is short, you will miss that shot. Also, the difference between m43 and Canon APSC is 2x vs. 1.6x. The RX100 is 2.7x Your claim the RX100/m43 difference is big and the apsc/m43 difference is small, is misleading (as usual). "When a 1" superzoom or an APS-C DSLR with a bog-standard 70-300mm lens do better, there's cause to worry." Again, I don't see any evidence of either of those scenarios being true. When you look at the 100% crops in a more controlled testing environment, it looks like the lens is basically tack sharp - center and corner - wide open at 200mm. With the 1.4x TC you need to stop it down 1 stop to f/8 before it can be considered tack sharp, but once at f/8 it's again excellent both center and corner. Androole: That's hardly a 'controlled' environment - the 100-400mm samples look orders of magnitude more contrasty (I'm assuming it was a sunny day, versus overcast ones for the other lenses) and thus look better than they should. Many of the sets are wildly inconsistent - some of the stopped-down samples are worse than the wide-open ones, and not because of diffraction effects (the 200mm corner crops are egregious). Regarding high MTFs, the 50-200mm doesn't come close to the prime. Like, really, it's no contest - its MTF 60 must be half that of the 200mm f/2.8, AND the prime was shot on a really dreary day (there are almost no shadows, and the reduced contrast hurts the samples). I'll admit that my 70-300mm comment was hyperbolic, but the truth is that the Sony FE 70-300mm G or the Canon 70-300mm L IS can produce results on the 50-200mm's level on a crop body, and they're substantially cheaper lenses. So, are people supposed to pay $500 for the slight size reduction? A quick check of Amazon shows Kharan is misleading AGAIN with the claim that the Canon 70-300L is "substantially " cheaper than the Panasonic. $1699 vs $1349. We must also consider that any Canon camera with close to the FPS specs of an EM1/2 will cost a few thousand more. Also, 70-300 lenses like the Sony FE are notorious for being soft at the long end. Cropping to match 400mm makes that even worse. And the Canon weighs 1050g and is 5.6 inches long, while the Panasonic is 655g and only 5.2 inches. Adding a body will only give the Panny an even greater size/weight advantage! The fact is, if you want a weather sealed camera and lens for hiking and outdoor photography, nothing can compete with these for the price and size. That really bothers certain people. It might be close with the Leica 50-200, but the Olympus 40-150 2.8 pro will literally smoke both the Sony and the Canon, not to mention the Nikon 70-300. Put that baby on an OMD EM 1 Mark II and you can easily surpass any full frame or Apsc 20 mp camera at a reasonable iso. Everyone is doing a lot of leaping to conclusions all over the place. No one has yet tested a PL50-200 next to an O40-150/f2.8, let alone next to a Canon 7D II on a 70-300L, or a 100-400L II on a 5D IV. We don't have any objective relative sense of how these lenses behave compared to each other. Sharp wide open, across the frame from edge to edge, and end to end. Other galleries I've seen shows it renders colours nicely as well. Difficult to fault. This is damn good lens in every aspect. I think it's not the lens' fault for the soft images in dpr's gallery. It is the photographer. ephotozine photoset is typical city takes, they always take similar shots (not a bad thing, as it helps comparing lenses with lenses). Those photos are not just sharp, they are also got higher contrast and clarity. This is all because of the weather and the location. DPR's photos are sharp enough, and actually shows more what this lens is about, it's intended purpose and use-cases! If I would buy this lens after seeing photos, these are the photos I would consider, not those on ephotozine, no matter how contrasty and punchy they are! If you check the galleries on this site you can see that they are not of the same quality. IMO, Mr. Rishi Sanyal, for example, is a much better photographer. The things that Rishi photographs are totally different. It's much, much, much easier to get clean technical quality and creative compositions with your own human family on an impromptu, opportunistic basis than it is to get compelling, technically flawless photos of wild animals on a very short work trip to a snow-blown national park. The comparison is kind of absurd. Mine is the long running argument with the reviewer in that article, who seems hell bent on seeing this as a 1-400 f2.8-4 equivalent lens and those are the comparisons he makes [talking of absurd ones]. I do like that site generally, but they have a blind spot so far as equivalence goes [although they're happy of course to use it when it comes to effective focal lengths]. When you make the correct comparisons in terms of the entirety of equivalence [so this is either a 50-200 f2.8-4 or a 100-400 f4-8] you can't escape the fact it's an expensive bit of glass. Not so ridiculous as what they want for a 200mm f2.8 prime, but still very much on the pricey side - and both the big MfT OEMs are doing this with any new fast lens [and some of them aren't even that fast]. I like the weight balance of the format, but I can't help but think they're starting to take the p*ss with their lens pricing. When you make the correct comparisons in terms of the entirety of equivalence - i.e. this is literally a 50-200/f2.8-4, it costs exactly what you would expect it would. An OEM 70-200/f4 with IS costs $1100-1500. An OEM 70-200/f2.8 with IS costs $2100-2800. As an f2.8-4, you'd thus expect this lens to cost $1600-2150. And guess what, the lens costs $1700. Since $1600 < $1700 <$2150 the math checks out. Chris, once you chose a system, knowing its merits and issues, thinking of equivalence is less of a value. You got what you got! Personally I don't care much about the aperture equivalence unless am buying a portrait lens. For the rest, I agree with that website, focal length is all that matters! But that's just me, if this system is not for you for any reason, prices, sensor sizes, or whatever else, I totally understand! Why is thinking about what effect aperture values [and image noise] will have on your images 'less of a value'? Especially if you are explicitly comparing lenses between systems? If you don't want to make those comparisons, it's simple: don't do it. If you are going to do it, make ALL the comparisons which have a direct bearing on the resultant image. There are of course other factors [such as system size/weight] which are of personal value to me. Within the limits of use of the majority of my photography the MfT system is capable of what I want it do, most of the time. I'm just not prepared to fool myself I'm getting something for nothing. Pan/Oly have changed their pricing strategy on premium lenses since I bought into the system [and in order to mitigate the downsides of the smaller sensor, arguably there's a more pressing need for faster glass]. I don't feel any reason to debate on sensor performance (in ultra low light) with fullframe, obviously a quarter size sensor won't compete on that end. So that's why I was saying whoever pick m43 made a conscious decision to make a compromise on ISO 6400 upward ISO performance, (GH5s is narrowing the gap though, and I think it will keep getting better). - Sony FE 70-200MM F2.8 GM OSS is under $2600, 7.87" tall 77 mm filter thread and 3.26 pounds. and you will find similar trend among other lenses. I think most FF advocates would suggest that the best middle path is to go with f/4 lenses that are typically somewhat larger and more expensive than M4/3 f2.8 lenses, but are not in a totally different universe (the way the enormous f2.8 zooms for FF are). And that way you can still compromise and get 2/3 - 1 EV of advantage in terms of DoF and low-light noise and DR vs. M4/3. @Androole middleground yes/ maybe for f/4 constant on FF or f/2.8 on APSC but when its to get best match, I feel m43 meets mine the most so far! I agree with all your points about the weight advantage, but if you're comparing [for instance] a 12-35 f2.8 for Mft vs a 24-70 f2.8 for 35mm format, it's apples and oranges. It isn't just about high ISO performance it's also the DoF characteristic, which on the smaller sensor is equivalent to f5.6 - no subject isolation whatsoever [beyond macro] at the wider end. Which is why the format NEEDS fast/wide primes and why I've got a good few of them. The original Panasonic standard high end zooms [the 35-100 and the 12-35] weren't all that badly priced, [although still not cheap when you actually compare like for like on everything, not just cherry pick the things you like] they've just gone a bit nuts since. If subject isolation/high ISO/very high pixel count aren't important to you, you could ask why not a 1" sensor camera? For me MfT has hit a sweet spot for capability/portability. I just don't like paying a fortune for lenses which don't offer as much facility as I need. @Chris, I am not comparing 24-70 with 12-35, I clearly mentioned that I am choosing m43 for different reasons. For those very rare moments I got some primes and Sigma 18-35 which with metabone XL adapter gives me f/1.2 on m43. Actually I quite like the m43 f/4 or f/5.6 as I can get most of my scene sharp with it, for fullframe I have to close my apperture upto f/8 to f/12, which makes it slower and then your advantage of higher ISO is all of a sudden gone. I would request you to see my photos on lightnodes.com and then suggest me where you think shallower Dof would be of any use, as most of them are landscape photos. I don't mind 1" setup either, but maybe for the day when their lens lineup and video capabilities will match my need. Until then m43 is my sweet spot too for capability/ portability! But if I have to chose between these two, I would probably chose 50-200 over 35-100, as it pretty much cover two lenses as it opens at 50mm f/2.8 and goes quite long on 200mm and f4 is still brighter than many tele-zoom on m43! So if it save some space in my carrying bag I would pay for the extra price and that's what Pany/Leica is asking for! Great to see this lens review -- especially given that it's m4/3. It seems nifty, but at $1600.00+ it better be tack sharp, corner to corner, at 200mm. I do not understand. You consider $1600 a lot for a manufacturer brand state-of-the art zoom lens in the long focal length range? Unless it is tack sharp, corner to corner, at 200mm, while at f4. My Canon 70-200mm f/4L IS was, and it cost considerably less. It's simply not too much to ask. According to this review, the lens stands up very well to scrutiny. Even still, I'd rather put that money into the 100-300mm f/4-5.6 II and a couple of prime lenses. Not judging by the photos in your gallery. I haven't posted images with my 100-400! NZ Scott: Not only is your comment rude, it's also false. mgm2's photos look quite good, and certainly orders of magnitude better than the crud that these samples are (in great part because of the terrible weather, but still, there's nothing technically or artistically compelling in them either). Well, I disagree with your assessment of the respective image samples. As for rude comments, both yourself and mgm2 have insulted Barney Britton, who reads these threads. mgm2: Perhaps you could post some samples in your gallery as evidence to support your assertion? Many, many people jump in to these threads to criticise, but very few offer evidence that they achieve better results. Well, I'm sorry for Barney, but it's obvious that wildlife photography isn't his forte. In fact, from other articles he has written, he's been much more active in concert and street photography, in which he's certainly more proficient. Still, the samples are crud. The weather was horrible, and the camera and wildlife didn't cooperate. mgm2's photos are at the very least technically superior - we may not agree on subject matter or composition, but the technical part is incontrovertible. And that's the thing, these are *samples*, not art gallery pieces. They need to show what the gear is capable of. The only thing they show is that the lens and camera are quite rugged, but with Panasonic that's hardly a concern. At 100 to 400 equivalent it keeps you well away from the dangerous animals.Good idea. The bird pictures have little or no feather details. He was shooting stopped down at high-ISO, for some reason, and this causes detail to be lost to noise and diffraction. There's no need to stop down with this lens. Fully agree with @BostonC ! Yes some photos are shot at high iso, but thats wildlife shooting, you better have a proper camera which can handle this right! This images look more like I'm shooting with my cheap 50D and a cheap 55-250mm STM. When I switch to my 5DMKII and the Sigma 150-600 I'm getting razor sharp and detailled images. OK mft is a bit smaller and lighter but the compromises are visible in the end result IMO. The point is that he could have avoided the high-ISO settings by opening the lens to f2.8-4, thereby improving the image quality. With many of the sample photos, he could have gained 1-2 stops by doing this, which is effectively the difference between M43 and a full-frame camera. "I still don't get Olympus and Panasonic selling toy cameras at full frame prices..."
This is a f2.8-4 lens. I'd have expected to see many 200mm photos shot at f4 instead of f5.6 or higher. A shame that there is only a single one of an animal shot wide-open at 200mm. Personally, if I buy this lens it is to shoot at at f4 and not f5.6, f8 or so. Pretty lame and useless gallery. Maybe the purpose was to show us the result at smaller apertures? Which is pointless when the tested lens is f2.8-4. If I buy a 2.8-4 lens I want to see how well it perform wide-open as it will very likely the most used aperture. Say you see the review for a f1.4 lens. Are you that much interested in seeing how well it performs at f8? Obviously if you consider a f1.4 lens it is to be used wide-open... Go figure. Then why we got smaller apertures on lenses? Pretty much any lens performs well once stopped down to f6.7 or smaller. In MFT land, past f5.6 and you're into diffraction territory (usually before that even). So it's pretty much pointless indeed. Tell me this: if dpr were testing the Oly 45mm f1.2, would you be happy if all the shots except a single one were shot at f8? "Pretty much any lens performs well once stopped down to f6.7 or smaller"
until the diffraction kicks in and in m43 it occurs quick quickly! But in general I agree with you mate, if there are no photo wide open or only a single one, probably this ration needs to improve in future! Diffraction hits usually after f/8-11 range and in many cases f/16 shows little diffraction. It is the perceived diffraction limit, reality - not a theoretical limit. 12-40mm: "We did see some diffraction softness come into play at the smaller apertures such as ƒ/16-ƒ/22, but overall it wasn't very severe." 40-150mm: "this lens is sharp, everywhere, all the time from ƒ/2.8 to around ƒ/11-ƒ/16, where we see minor diffraction softness coming into play." 25mm f/1.2 pro: "Diffraction limiting starts to set in at ƒ/11, but you'd be hard-pressed to notice it -- at ƒ/16, you may note a slight generalized softness, but then, at ƒ/16 this lens performs about as well as some lenses do at their best settings." 300mm f/4: "Exceptional sharpness is maintained as you stop down, though we do see minor diffraction-related softness come into play around most around ƒ/16-ƒ/22, but it's quite minor. All said and done, the Olympus 300mm ƒ/4 Pro is fantastically sharp." The real limit with this lens, like so many Panasonic latest best lenses have, is the variable F-stop ratio. Usually f/2.8-4 depending focal length, and it often has gone very quickly from f/2.8 being available only at shortest and then right after it drop 1/3 stop and 2/3 stops before you are even half of the focal length and you have lost one stop about when going 2/3 of the focal length range. If you are a full manual shooter where you need to control all variables and you want speed and easy to use camera, you are forced to use all Panasonic lenses as f/4 lenses, not as f/2.8. The whole scale from f/2.8 to f/4 is lost. They could very well just be made the lens as f/4 in the begin and just leave the f/2.8 out. Nothing is more annoying than observe how your exposure varies based how your framing is required to be in quick situation and see how you need to start going past the acceptable ISO limit or lower acceptable shutter speed. No disputing this is a high quality lens, but the size and weight for MFT is as much as I would tolerate on full frame and then only grudgingly. As for the price, gear now often is aimed at those who are prepared to pay way over the top. Even with the quality, this is not value for money. Ephotozine of this lens says " It is easy to see the attraction of lighter, smaller cameras and lenses, especially when the quality is still extremely high." LOL. If you would only begrudgingly accept this size and weight on FF, then I must take it that you have never shot with a focal length longer than 300mm, nor an aperture wider than f5.6, nor ever an "L" grade lens in the first place. @keepreal : Yours is an uninformed comment. Overall system size for m4/3 is much smaller than FF, especially when venturing in to the telephoto arena. On top of it, this lens is not heavy, by any standard, as you imply. Micro 4/3, APS-C, and FF each have their uses and their niche. Each has its pricing. Each has its value proposition at a different spot than the others. No point criticizing any of them in comparison to the others. Wow Dr Jon is spreading the BS like a true fanboy. First, notice how he failed to mention the Canon costs a whopping $2000 more! Hilariously, his camera can only shoot at 5 FPS!!! The Oly can shoot at 60 FPS. Then he cherry picked a lens different than the article. And of course failed to mention the M43 was almost 2 inches shorter than the giant Canon lens he picked!!! LOL!!!!! And since the Oly he cherry picked is a bit sharper wide open it will still yield greater resolution despite being 100mm shorter!!! And again, fanboy Jon is stuck at shooting at a lousy 5 FPF while the Oly is shooting at anywhere from 12 FPS to 18 FPS to 60 FPS! The oly is 227mm, the Canon 256.5mm, so 29.5mm (1.16") longer, not 100mm. The Canon is 20g lighter. You get one stop more total light with the Canon. I'm making a point about the equivalence comparisons people make. I used to have a GH4 and you got about the same detail at 100m (real, not equivalent) as you do with a 100mm lens on a 5Dsr. I now have a GH5 and it's a little ahead of the 5Dsr. No need to cherry pick, I could do a pile of comparisons, the point is the 50-200mm is in no way comparable with a 100-400 for a bunch of 36/42/45/50MP FF users. If you have a 20MP FF camera it is. @Dr Jon - if you crop the Canon from 400mm to 600mm to match the field of view of the Olympus, regardless of pixel pitch, you've now got a 1.5x crop factor with your Canon. So in fact, you have less total light. Not 1 stop more. The number of pixels you have resolving that cropped area is important, but slightly tangential to the point you were trying to make. That argument goes for noise, dynamic range, and depth of field. Dr Jon is busted for LYING again. The Canon camera he cherry picked coats $3700 on Amazon. That is almost a $2000 difference!!! Plus the crappy Canon can barely shoot at 5 FPS. Of course Jon is being dishonest which is why he picked a lens different than the one in the article and being discussed in these comments. You're being pretty insufferable, @Mastering Light. Don't be that guy. On par with Olympus 40-150mm f2.8 & MC-14?? The MC-14 makes the 40-150 substantially softer at the tele end. If I knew I would need a 400mm equivalent I would just spring for this lens instead. The 40-150 is a fantastic lens by itself but the teleconverter just isn’t up to par. Then get the better TC. As with good TC unit you don't perceive "Oh, this has been taken with TC, that isn't". As you get extremely sharp results with or without. What "better TC" do you mean? The only TC compatible with the 40-150 is the MC-14 and there's a very significant hit in sharpness when shot wide open with the TC mounted. Funny how nobody who has a "good" copy of the TC ever posts any meangingful comparisons with it and every measurement from the various lens testing sites shows a huge hit in sharpness with TC. That's pretty impressive, especially when you consider how small the combo is. I'm more excited to see the video these came from rather than these shots. These look a lot better if you process the RAW in a way that might actually look like you were intending to create a decent photo rather than the opposite. Suggest anyone interested in this lens opens the RAW files and looks there. How do you preferentially process them? I suspect that any processing done on these images is supposed to be neutral and understated. That tends to be DPReview policy on sample image galleries. This is a lens sample gallery - we don't overcook the samples because it would be misleading. That's why we provide the Raw files for download. If I recall correctly from previous comments, it is DPR's policy not to apply any luminance noise reduction. I don't think that is typical or even understated processing, and in fact when any sharpening or contrast enhancement is applied it is detrimental to image quality. So I'm completely with AshMills on this one. Personally I try not to "overcook" either, and I respect DPRs policy of standardisation, but undercooked is less healthy still. My feeling is that ACR's default sharpening/DNR etc settings (ie. with "detail" turned up, very little sharpening, no masking and no DNR) is really quite a poor default. It may well be poor for larger sensors too, but I do think m43 suffers with the default settings, perhaps because of the smaller pixel pitch. Luminance NR is left at default for lens galleries. Sharpness is dialed back to +25 (where it used to be before the recent updates to ACR) but we're still figuring out our policy in the light of those updates to ACR's default behavior. @Barney. Although I appreciate the gallery, for some shots the settings seem a bit odd if this is a lens sample gallery as you put it. Take for example the shot of the two birds in the water. You used Aperture-priority at f8 (after analizing the jpeg). With that setting it is hard to judge the quality of the lens with diffraction kicking in. And if this was used to try the stabilization, it wouldn't make sense at 1/500 shutter speed. Still, nice images in challenging conditions, but hard to judge a lens on. These are totally fair points, and we will be adding more images in this gallery taken in less challenging conditions very soon. The G9 was having terrible trouble nailing focus in the snowy conditions (it kept front-focusing on falling snow) so a couple of the images I know I stopped down a bit just to ensure decent depth of field. Hopefully you still got something out of the pictures but don't worry - more on the way. That's a fair point, I know depth of field goes totally to crap when you're at 400mm f/4. If you don't get the focus bang on, you might as well not have even bothered. The recent Panasonic lens offerings are very impressive. The Leila DG branded premium lenses are a quality alternative to the Olympus Pro zooms (which I use). The E-M1 II and GH5 plus this lens, or my own 40-150/2.8 TC1.4 are way lighter than my previous D700 80-200/2.8 which I loved, but struggled to carry with 28-70/2.8 and 17-35/2.8. I accept the limitations of the smaller format..but get shots as I take my camera places and don't leave it at home...! How do you find the AF speed of the Em1 mk2 compared to your D700, I made the switch from EM1 Mk1 to D500 for AF speed, but the combinations are heavier. I could be tempted back again if the m4/3 world improves. You are absolutely correct in that I used to carry my em1 everywhere, now its more of planned excursions. If some look good then the lens is good, of others don’t it is likely the technique or photographer. Albert Valentino is clearly right. If nothing in the image looks sharp, the camera was either misfocused, it moved, or there was shutter shock (unlikely these days). It's really as simple as that. Or a weakness of the camera. It got mentioned sometimes in the forum (and I had it with my own G81) that with Panasonic cameras even when the focus box is fully on target the camera focuses on something (probably more contrasty) outside the box. There is just little chance to see this in the EVF while taking the photo as long as it isn't severe misfocusing. The real question is, why are they posting the poor shots to showcase a lens? I may take dozens of shots when i get a new lens to check it out. I only judge the lens by the good shots and ignore the poor ones since only the good, sharp ones reflect what the lens can do. So why post poor shots at all? "Luminance NR is left at default for lens galleries. Sharpness is dialed back to +25 (where it used to be before the recent updates to ACR) but we're still figuring out our policy in the light of those updates to ACR's default behavior." Looks good to me. Wildlife is one of those pixel peeping nightmares, we end up viewing the equivalent of 4 foot prints looking for the finest hairs or feather detail which would never be visible in a standard 11" x 17" print anyways. One of the problems with slow telephoto lenses (yes, f/5.6-8 eq. is slow) is weak background separation. This is not such a problem with, say, 50mm eq. FF lenses of this type like 100-400/4-5.6 are on the slow side, as well and faster lenses are very expensive. I'm not sure if you realize it, but the values listed in the gallery are actual FL and aperture values, not equivalent values. That is to say, the photographer has stopped down many of the images by at least 1-2 stops (or even more). There is significantly more subject separation available to the user. That aside, and it is obviously a subject to debate, but many award-winning wildlife photographers prefer to stop their lenses down as much as the conditions will allow in order to show the environmental context that the animals are in. For many, that is a very important part of the photograph's impact. If all you are looking for is a wall of blur, it might as well be taken in a zoo. I realized it, of course. When you are close enough or you have a really long FL to frame tight, you can stop down. The photos posted here are nothing like the ones you linked to in terms of the framing. The background ruins most of them except for the ones with the haze/the snow which soften the background and they look rally nice. J A C S, you appear to be confused and misinformed. Many of these pics were taken at F8 and F7.1 (on a sharp F4 zoom). The lack of separation was intentional. But to help you search for NZMacro's gallery. He primarily uses Sony APSC and Olympus M43 cameras and you will see he gets plenty of "separation. And for those who do not know he shoots with manual autofocus- a great skill. If one owns an FD 600mm canon lens, he will get far greater detail on distant subjects with an M43 camera like the G9 versus any Canon FF camera. It is that simple. "If one owns an FD 600mm canon lens, he will get far greater detail on distant subjects with an M43 camera like the G9 versus any Canon FF camera. It is that simple." Not least because it's impossible to mount that FD lens on a Canon EF body, thanks to the shorter flange distance. @J A C S: I'll try once again (I've posted on this before). This is a telephoto lens with an aperture range from f/2.8 to f/4.0, not f/5.6-8. That is hardly slow, esp. for a telephoto that gives the same as 400mm on FF. You are confusing DOF equivalence with exposure. For example: Say you are shooting a scene with film (using digital is just the same) with an of ISO 100, and with a 35mm and an 8x10. The exposure meter says the proper exposure is 1/60th at f/11. Therefore both the 35mm _and_ the 8x10 would use that exposure, or 1/30 at f/16, or 1/125 at f/8, etc. Format makes no difference - that's why exposure meters don't ask you to input the format you're using. @Mastering Light: You appear not to be able to read. I did not make comments about specific shots and I even mentioned a faster lens. It is a remark in general about values of such lenses. @SantaFeBill: You need to understand equivalence (as simple as multiplying by 2). You need help with reading comprehension, as well. I would say that the bigger problem with telephoto lenses is getting *enough* depth of field -- say, to keep most of an anima or personl in focus -- while also gathering enough light to avoid high ISOs. Blurring the background is rarely a problem. This is an area where the smaller sensor is actually an advantage. Actually, exactly the opposite. Since the DOF depends on the f-number only (same framing, relatively shallow DOF), telephoto lenses have deeper DOF than normal lenses in general (there is no 400/1.4 lens). The smaller sensor advantage is a myth. I agree with amtberg, and not J A C S.
Yeah me too - agree with amtberg, not JACS. I can't believe how quickly this thread got derailed with petty bickering. And pixel-peeping aside, the photos of the buffalo in the driving snow are really atmospheric and moody, and I thought the sparse trees sticking up in the snowy environment were very nicely composed as well. Finally, while it's a shame that the focus looks like it missed a tiny bit on the grey wolf, in the pond, when taken as a whole it's still a cool picture. Anyway, not that I have anywhere near $3500 worth of gear, but I'd be really happy to have a few photos like this myself. One pinch of semi pro wildlife scenario + two pinches of the equivalence/format fanaticism that plagues every M4/3 article = inevitable derailment. I haven't seen one M4/3 lens article (be it a gallery, announcement, or whatever) on DPR in the past year or two for which more than 1/3rd of the comments are actually about the lens in question, rather than nonsense arguments. It gets pretty tiring, I can't help but think that either this discourse encompasses the whole of DPR's audience, or the average reader simply ignores the hot mess that is the comments section. I guess I should start doing the latter. Note to Oly and Pana ..... This is the size and capability of lenses I would put down $$$ for ...... If you can make the price more reasonable some how you will probably have a lot of takers. The price is a little steep, but not grossly so IMO... I would've been interested if it were < $1,500 but I dunno how realistic that is in today's market. Just like I had little hesitation in grabbing the PL8-16 or the 17/1.2, because I'll shoot the heck out of those. I won't shoot this long a FL anywhere near as often, so I settled for the comparably sized albeit less versatile 100-300 II at 1/3rd the cost. That's the great thing about M4/3 tho, plenty of choices at plenty of price points. I do not understand the small apertures used. F8 and F7.1? 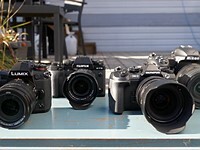 Anyway, with 5 axis IS and the smaller lenses, these cameras are by far the best for many hikers and wildlife shooters. And if you are only going to shoot between F4 and F8 then the 100-400 would be a better choice. And for those who don't get it, you will get far more detail on a distant object with a G9 and a Canon 400mm lens than with any FF camera and the same 400mm lens. Perhaps because F/8 is very commonly used aperture and the photog wanted to see how the lens performed there? It's a very commonly used aperture, but rarely the best performing one on M4/3. It's common because it's often necessary to get sufficient depth of field when shooting FF. Unless they need f/16 equivalent depth of field, for sharpness almost every single M4/3 lens - especially wider aperture ones - will perform best between f2.8-f5.6. What if it is so bright outside that I NEED to use f/8 and i dont want the image compromises that come with neutral density filters? So bright that you can't shoot at ISO 100, f5.6 and 1/8000s? That's a heckuva problem to have! The pixel pitch on the 5DSR is 4.14µ compared with 3.34µ on the G9, only 24% larger, which means the maximum extra resolution you would get with a 400mm on the G9 is equivalent to having a 500mm lens on the 5DSR. We were shooting in very bright conditions, and we try to avoid using ND filters or fully electronic shutter in lens galleries. Some of the small apertures were selected simply to give long enough shutter speeds to (for example) blur falling snow or test the image stabilization system. Great point. For half the price of a Canon camera, one get more detail (resolution) when shooting distant subjects. So while the G9 is a "crop" camera, it is a crop of an 80MP image (vs. Full 50MP, 36MP, or 24MP). For me this is another proof that m4/3 is most overprcied system for what it offers and Panasonic jpg colours are behind all the competitors. And how much does a Nikon D810 and 100-400 lens cost? Okay, now that you thought about that, here's my question. Well, to be fair, you can get a D500 and a 70-200/f2.8E VR + 1.4x TC for... $5200. (But seriously, even when paired with the 70-300/f4.5-5.6E VR which is not really in the same class, that's still a $2600 kit, so it's not like the price is in a whole different universe). Panasonic colours are great. I'm a Nikon shooter myself, mainly, but I know a number of fellow landscape photographers in the UK who produce some excellent pics using Panasonic cameras. The quality of the browns and similar shades capture the magic of the UK uplands in way few other cameras do. Whatever, a good selection of shots. The colors are really bland and dull. Oh, wait... that’s just because it’s winter. Barney , good work but a slight error in the text. fixed, thanks for the catch! Barney, you're a better editor/writer than a wildlife photographer. If I paid you to showcase a lens I made, I'd want my money back. The elk photos were not good. I'm guessing the focus point was not on the head in #1 as the middle of the body has some sharpness, however the head bordered on being blurred. The other elk shots were also not good. I understand some of the photos were taken during it snowing, but to post images such as these to showcase a new lens (which is probably a good lens) was poor judgement imo. Lastly, I've been to Yellowstone a few times and never even thought to take a photo of a sign not matter the intent when this place is a wildlife & geo-feature extravaganza. Id be happy to test your lenses next time. ...Did...did you not notice the bird that was on the sign? Yes, but I think the sign is the better of the two. Seriously though, that bird is supposed to highlight the strengths of that lens? Give me a break! Better to have taken photos at a bird feeder. It is a sample gallery, not Wildlife photographer of the year. The images are real world examples to allow you to see the sharpness, bokeh and colours of the lens. Were they all shot on a tripod in that case? All hand-held. One of the things I wanted to test was the effectiveness of the combined I.S. system. @bexter, Sample yes but what kind of samples?? Of poorly shot images? Look, this is supposed to be the most popular website of its kind so the bar should be raised. Showcasing a new lens and being paid by Panny for those?? When someone pays me to produce images I give them my best. Those were poor, very poor. Sometimes I wonder the need of people to comment like Gatoraied. Did he have a terrible childhood? it is a lense test! Keep up the great work Barney!!!! @ Viking, If mediocrity is your thing go for it, but it's not my thing. Taking sample images of a new lens for a big company like Panasonic and producing images such as these is inexcusable. They in no way showcase this lens's capabilities. The same person and staff that rip apart every feature of the gear they review. I'm reviewing these samples and my conclusion is that they are terrible. I think you are really misunderstanding the situation. DPReview doesn't make sample images for Panasonic. They make sample images for themselves. These are not promotional images. They are real-world shots that one of the editors - not a professional wildlife photographer - happened to take, on a short trip, in difficult conditions. I understand perfectly but you do not. Sounds like Barney (or someone) needs to weigh in on the details. That disclosure does not suggest to me that they are working for Panasonic. Androole. I really cannot understand your blind defense of those photos and that you are at a loss to understand that Panasonic essentially sponsored the photoshoot. It's not that ambiguous unless you are in denial. The images do nothing to showcase that lens. If Panasonic sent me that lens and body, never mind sponsor/subsidize the trip to Yellowstone, I would take images in the best manner possible. Subsequently, I would never publish out of focus or poorly selected subjects at a one of a kind in the world venue such as Yellowstone. Finally, I would be embarrassed to publish anything but the best images possible out of respect for the efforts made by Panasonic to produce such a lens and my obligation to them for the "support". Dreview's job was to take the best images possible, which would clearly show potential buyers how good or bad this lens can be. This was not accomplished. I would agree that if Panasonic was paying me to produce promotional images for them, I would only publish flawless images. Ipso facto, it doesn't sound like DPReview has that kind of relationship with Panasonic in this context. Because they published images taken in poor, difficult conditions, and are willing to explain that as being part of the testing process. ...the other hint that Panasonic isn't paying DPReview is that DPReview has literally never had that kind of relationship with a camera company before. And I can't imagine they would start one without announcing that, as it would be a radical conflict of interest in terms of editorial objectivity. "it doesn't sound like DPReview has that kind of relationship with Panasonic in this context"
Correct. We're working on a video featuring the Panasonic G9, and these images were shot during the shoot. Getting sample images with this lens was not the purpose of the shoot. Some people need to take a deep breath and calm down a little here, I think. Barney, my contention is that the images should never have been published, period. They serve no purpose to the viewers here, to Panasonic or to you. Either do it right or don't do it at all. Theres enough amateurs in your forums that can't resist to post every photo they take, which are usually very very poor. I can excuse them, however I think you can and should know better. Wether you were paid or not is not important , what is important that you show the best a lens or camera can do and not some willy nilly photos that you say were "not the purpose of the shoot." If not the purpose then why publish them? "They serve no purpose to the viewers here, to Panasonic or to you." That is untrue. I'll respectfully debate with you up to a point, but now you're just being silly - and quite rude. Is it so difficult for a reader to express his /her opinion[reasonable and supported by data] without being run down by 'oversmart oneliners' going to the extent of attacking his childhood? Many images appear really soft, due to the higher noise of MFT, the atmospheric conditions and photographer error. The first two were hard to avoid in the shooting environment but why are so many photos shot stopped down? Not only could you lower your ISO, Above F5 you are already into diffraction territory with MFT. Really no reason to shot MFT at F8 unless you need huge DOF. Edit: Also can it be that the first shot is slightly missfocused, with focus shifted slightly behind the deer? Look at the background and how much sharper shot 22 is. Nice to know that diffraction limitation on mFT has moved from above f8 to above f5 the last couple months. I really wonder why they even allow f22 on most (all?) lenses. Would be way cheaper to produce apertures with stops that only allow taking undiffracted images. On the other hand I happily use f11 and f13 on my mFT camera. I see some softness and how sharpness gradually degrades. But I NEVER had the impression a shot was ruined by stopping down to f13. And I also don't think diffraction is an issue in these shots. To me no difference between f4, f5.6 and f8. That you are ok with sharpness at F13 doesn't mean that this aperture is not severely limited by diffraction. I covered this in another comment but we were shooting in very bright conditions, and we try to avoid using ND filters or fully electronic shutter in lens galleries. Some of the small apertures were selected simply to give long enough shutter speeds to (for example) blur falling snow or test the stabilization system. There are plenty of images in here shot at optimal apertures. I get the artistic effect with the snow, but on all other shots your maximum shutter speed was 1/500. The mechanical shutter goes all the way up to 1/8000, which is four stops higher. In every lens review gallery we aim to capture images at a span of apertures. The shot of the running coyote was a grab shot, taken immediately after shooting 60p video (hence the exposure time). I included it because a) it's very detailed and b) it shows the efficiency of the I.S. system when panning at a long focal length. Nice, but you might have overdone it. There is just a single image in this gallery @200mm wide open and base ISO. And showing the lens at F8 is nice but not if nearly all your images are stopped down to a point beyond the diffraction limit. After reading your comments, panther, I had a closer look, and I completely agree. All the images are mushy, unimpressive, washed out. I am happy that I went for full-frame four years ago. If this is the usual quality of a M43, I am really disappointed. I used to have a Panasonic FZ2000 with a similar Leica-designed lens, and the images were soft either. Eventually I sold the camera, and I am not touching Panasonic again. Can you show at least one clean, details-rich photo with this lens on a Panasonic camera? "Can you show at least one clean, details-rich photo with this lens on a Panasonic camera?" Yes. There are several available for download and inspection. Don't be so dramatic. That's my gift to you. You can go to 100% on that one. Heck, you can probably go to 200% on that one, if you're one of those types. Szia Miki! I know it is a bold statement, but I think the last m43 Panasonic camera with rich colors and good tones was the Panasonic GF1 (GF2/3). Also, somehow at 12MP they did not suffer from this pixel-level blur as the 16MP or now the 20MP era. Yes, above ISO800 they were noisy, and I know, the DR. But except extreme DR or really low light, they shined. I bet even these pictures looked better with a G2 for instance. But also, checking the Canon M50/M6 samples, it seems that those cams also produces much more lively images. As I have mentioned in the past, I carefully tested a friends full frame canon 6D against my Olympus OMD EM 1 Mark 2, both 20 mps, just to see how the two formats compare in the real world. I used the 16-35 f4L and 24-105 L and the 12-100 pro on the EM 1 II. . Aperature settings were carefully matched for obvious " equivalent" dof etc...mirror up for everything on the 6D, bith cameras shot at 200 iso. The results? No difference in the images up to 200 percent view in Photoshop....nada! You couldn't see the difference in the two formats, tonality, etc. My friend wanted to se how the lenses stacked up. The 12-100 and Canon 16-35L were very close in the overlapping range used (the 12-100 doesn't go as wide) The 12-100 was a bit sharper overall when compared to the 24-105 from our test, pixel peeping of course. This is interesting because I maintain that my copy of the 12-100 is sharpest zoomed beyond 50 mm and sharpest overall at 100 mm!! An exceptional performance! Nice nature pictures taken with a fab lens.